Picture this. You’re on a plane, flying from Vancouver, B.C. to Sydney, Australia. You’re flying over the Pacific Ocean. For the last 12 hours, your flight has been perfectly uneventful. And then suddenly the captain’s voice comes over the plane’s speakers. There is a boat in distress, the captain explains. And the plane is going to change course in order to help look for it. 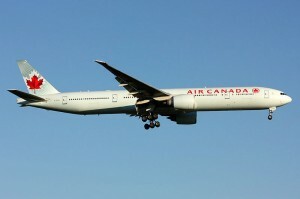 That’s exactly what happened to 270 passengers on board Air Canada flight AC033 last Monday. The captain was told there was a “vessel in distress” somewhere in the Tasman Sea, which is between Australia and New Zealand. A yacht with one person aboard had left Sydney, Australia, about two weeks earlier. It had lost its mast, was very low on fuel and had been drifting. There were no other aircraft nearby who could help to locate the yacht, so the huge jetliner was called in. The captain of the plane checked that there was enough fuel for a detour. The passengers were asked if anyone on board had binoculars; everyone was told to start looking out the windows and if someone spotted the boat, to push the “call” button near their seat. The plane descended from 7,500 metres to just 1,800 metres and started circling around the area where the boat was thought to be. Someone in the plane saw the yacht! They pushed their call button to let the pilot know where the boat was. Everyone on the airplane cheered. A police boat was sent out from Australia to rescue the stranded sailor. After that, the Air Canada plane and its passengers flew on to their destination in Australia—this time, without further incident. Many of the facts for this article were taken from this Globe and Mail article about the incident. When journalists write a story, they try to write from a neutral point of view. How would this article be different if it was written from the point of view of: 1) a passenger on the plane, 2) the person on the missing boat, 3) the pilot of the airplane? The lengths of the sentences in this article vary. There are many short sentences, several medium-length sentences and a few long sentences. Why do you think the journalist chose to write in this way? How do the length of sentences affect how you read and understand the article? Recognize a few organizational patterns in texts of different types, and explain how the patterns help readers understand the text (OME, Reading: 2.2). This article includes verbs in both the present and past tenses. Identify all of the verbs in the article and explain when and how the journalist switched tenses.